Patrick McBrearty says there is no sense of gloom in the Donegal squad despite the changing of the guard in the county as they prepare for Sunday's Football League opener against Kerry. Colm McFadden, Rory Kavanagh, Eamon McGee and Christy Toye have been high profile retirements while several other players have stepped away for now. "Ten or 11 young lads have come in and have been brilliant," says McBrearty. 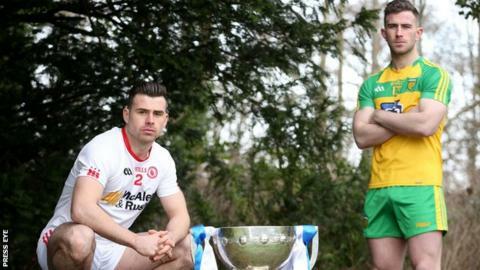 "They will get experience and that will be great for Donegal football." Those in the frame for league debuts against the Kingdom at Letterkenny include former Leitrim player Paul Brennan and his Bundoran club-mate Jamie Brennan. Rory Gallagher could also pitch in St Michael's player Michael Langan and Cloughaneely's Jason McGee, who both featured for the county in the recent Dr McKenna Cup. In addition to the 2012 All-Ireland heroes who walked off the inter-county stage after last summer's quarter-final defeat by Dublin, Gallagher also has to plan without Odhran MacNiallais, Leo McLoone and Anthony Thompson, after they opted out for this season. Recuperation from injury also means that Karl Lacey, Martin McElhinney and Neil Gallagher will be absent for Sunday's game with Gweedore's Ciaran Gillespie also missing after picking up a hamstring injury in a recent challenge game. McBrearty, himself, is only 23 but is preparing for his seventh senior inter-county season after making his debut as a minor in the Ulster Championship game against Antrim in 2011. "A lot of the boys retired after being there for over 10 years but we can't dwell on that. "The new boys are pushing the rest of us every night at training and there attitude is just brilliant." With Donegal, by manager Gallagher's admission, having "done a lot an awful lot of work" over the last couple of months, McBrearty has scarcely had a break since the defeat by Dublin last August given that Kilcar reached the county final and his ongoing commitments with Martin McHugh's Ulster University side. The Kilcar man admits his GAA workload is "tough to be honest" but in his next breath says "there is nothing really else I would want to do". "In fairness to Jordanstown and Kilcar, they are fairly relaxed about the whole thing. You are doing a lot of training with Donegal so they (university and club) give you quite a bit of leeway. "It is tough at times but is still enjoyable. I've become accustomed to it over the last seven years. I really don't know anything different to be honest. "The body is feeling good and I've been very lucky with injuries compared to some of the other boys. "We've had a lot of good days out with Donegal. As long as we keep being competitive at a top elite level, there's nothing else I really want to be at, to be honest." So while McBrearty already has banked an All-Ireland medal and played on two Ulster title-winning teams, he appears determined to terrorise inter-county defences for some time to come.